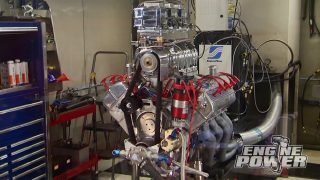 (PAT)>> TODAY ON ENGINE POWER WE KEEP DIGGING ON ONE OF OUR FAVORITE PROJECTS THAT WE'VE BUILT HERE IN THE SHOP. OUR 1962 CHEVY TWO NOVA CALLED "PRO STREET OR NO STREET" IS DANGEROUSLY CLOSE TO FIRING UP. NOW WITH A PROJECT LIKE THIS THE DEVIL IS IN THE DETAILS, AND WE HAVE A TON OF VERY SMALL BUT STILL VERY IMPORTANT DETAILS TO ADDRESS BEFORE WE CAN HEAR 588 CUBIC INCHES OF BIG BLOCK CHEVY LIGHT OFF AND WE HIT THE PAVEMENT. SO LET'S GET TO WORK. 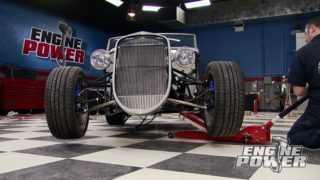 THE PROCESS OF BUILDING A HOT ROD CAN SOME TIMES BE ONE STEP FORWARD AND TWO STEPS BACK, WHICH IS THE CASE HERE. AFTER WE INSTALL THE BEEFY STRANGE ENGINEERING CUSTOM DRIVESHAFT, WE FOUND THAT WE HAD VERY LITTLE CLEARANCE BETWEEN IT AND THE STOCK TUNNEL. SO SOME MORE SURGERY AND FAB HAS TO BE DONE. (MIKE)>> OUR NEW TUNNEL WILL BE MADE OF THIS 22 GAUGE SHEET METAL WE ARE ROLLING IN THE SHEET METAL ROLLER. OUR RADIUS AT THE TOP NEEDS TO BE SIX INCHES, MAKING SURE THE ENDS STAY EVEN AND SQUARE SO THE TUNNEL IS STRAIGHT. (PAT)>> THAT IS RIGHT AT SIX INCH. (MIKE)>> NOW WE CAN TRIM THE SKIRTS ONE INCH LONGER THAN THE HEIGHT OF THE TUNNEL. THE EXTRA INCH WILL BE USED FOR A FLANGE. FITTING IT OVER THE CUTOUT SECTION SHOWS THE WIDTH IS SPOT ON. LENGTH IS ABSOLUTELY PERFECT. (PAT)>> OKAY, WIDTH IS GOOD! (MIKE)>> THE FLANGE PAT JUST BENT LAYS NICE AND TIGHT AGAINST THE FLOOR TOO. NOW IT NEEDS SOME HEAT. WELDING IT IN IS SIMPLE. MAKE SPOT WELDS EVERY HALF INCH SO YOU DON'T WARP THE METAL. THIS METHOD KEEPS THE HEAT CENTERED IN A SMALL AREA. THERE'S NO NEED TO WELD THE SEAM ENTIRELY. TO COMPLETE THE TUNNEL WE HAD TO ADD AN END CAP AT THE REAR. NOW THAT TIES THE TUNNEL IN TO THE FACTORY FLOOR. UP FRONT WE ADDED THIS PIECE THAT TIES THE TUNNEL INTO THE LARGE PORTION THAT PAT AND I HAD TO BUILD TO CLEAR THE TRANSMISSION. THE FINAL STEP IS TO SEAL THE ENTIRE AREA WITH SEAM SEALER TO KEEP OUT EXHAUST FUMES AND SMOKE FROM A BURNOUT. THE COMPLETED JOB LOOKS GOOD. THE MOST IMPORTANT THING THOUGH IS WE HAVE DRIVESHAFT CLEARANCE. (PAT)>> WHEN YOU BUILD A HIGH COMPRESSION RACE BULLET THERE ARE SEVERAL OTHER THINGS THAT HAVE TO FIT IN THE PERFORMANCE ENVELOP WITH IT. ONE OF THEM IS THE STARTER. THIS IS TILTON'S 40,000 SERIES SUPER STARTER, AND THE NAME SAYS IT ALL. IT HAS A THREE HORSEPOWER MOTOR AND A THREE POINT SEVENFIVE TO ONE GEAR REDUCTION TO GIVE IT BOTH THE SPEED AND TORQUE TO START LARGE DISPLACEMENT HIGH COMPRESSION ENGINES. IT COMES STANDARD WITH A HEAVY DUTY SOLENOID, AND WORKS WITH BOTH 12 AND 16 VOLT SYSTEMS. WHY DID WE CHOOSE A TILTON STARTER? BECAUSE IT WAS A STARTER USED IN THE DESIGN OF OUR LEMON'S HEADERS, WHICH WERE ENGINEERED TO FIT THIS TCI FRONT CLIP. USING SOMETHING ELSE WOULD CAUSE A FITMENT ISSUE, SOMETHING WE DON'T WANT. 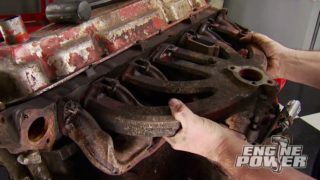 (MIKE)>> FOR CONVENIENCE WE'RE WIRING THE STARTER THAT PAT JUST INSTALLED BASED ON THE OLD FORD METHOD THAT USED AN EXTERNAL SOLENOID LIKE THIS. NOW THIS IS GONNA HELP US IN A COUPLE OF DIFFERENT WAYS. THE FIRST, IT'S SUPER EASY TO GET TO BECAUSE OF WHERE WE HAVE IT MOUNTED AND SECOND, IF THAT EVER FAILS, WE ALWAYS HAVE THE BACK UP OF THE SOLENOID THAT'S MOUNTED TO THE STARTER, AND THAT'LL COME INTO BIG PLAY IF YOU EVER BREAK ONE DRIVING DOWN THE ROAD OR AT THE TRACK. THIS ALLOWS YOU SEE HOW TO RUN THE JUMPER WIRE. FROM THE MAIN STARTER POST AN EYELET AND WIRE ARE RAN TO A POST ON THE SOLENOID. WHEN THE EXTERNAL SOLENOID IS TRIGGERED BOTH OF THESE BECOME HOT AND ACTIVATE THE STARTER. THIS RED CABLE COMES FROM THE HEAVY POST ON THE STARTER TO THE SOLENOID. THIS HEAVY RED CABLE COMES FROM THE BACK OF THE CAR AT THE BATTERY, AND THIS IS OUR TRIGGER WIRE FOR THE SOLENOID FROM THE IGNITION SWITCH. ONCE YOU TURN THE IGNITION SWITCH ON POWER GOES DOWN TO THE STARTER AND ACTIVATES IT. WE'LL BE BACK AFTER THE COMMERCIALS. 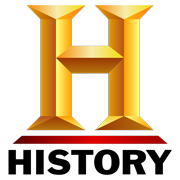 (MIKE)>> WE'RE STILL UNDER WAY WITH "PROJECT PRO STREET OR NO STREET". THE '62 NOVA WE ARE TRANSFORMING FROM A MID '90'S PRO STREETER TO A MORE MODERN STREET AND STRIP MACHINE. IT'S COME A LONG WAY FROM THE OLD 383 AND TURBO 350 IT HAD IN IT. NOW SHE'S SPORTING A 588 CUBIC INCH BIG BLOCK WITH EFI AND A KILLER TURBO 400 TRANS. (PAT)>> SPEAKING OF TRANSMISSIONS, IT'S TIME TO ADDRESS A COMPONENT THAT ONE NEEDS MOST FOR BOTH CONSISTENCY AND LONGEVITY, A TRANS COOLER. THIS IS GRIFFIN'S SMALL UNIVERSAL FLUID COOLER. IT CAN BE USED FOR TRANSMISSION FLUID, ENGINE OIL, OR EVEN POWER STEERING FLUID. IT HAS A DUAL PASS SINGLE ROW DESIGN WITH ONE AND THREE QUARTER TUBES, AND ALSO HAS HALF INCH PIPE FITTINGS WELDED ON. IT COMES WITH A SPALL FAN ALREADY ATTACHED, AND GRIFFIN PRESSURE CHECKS EACH ONE OF THESE UNITS FOR LEAKS BEFORE IT LEAVES THE FACTORY. WE DON'T HAVE MUCH REAL ESTATE TO MOUNT IT, BUT THERE IS JUST ENOUGH ROOM AT THIS LOCATION. THE FAN WILL BE SETUP AS A PULLER, AND THERE IS AN AIR GAP BETWEEN THE COOLER AND THE FLOOR PAN. FOUR FASTENERS WILL THROUGH BOLT IT, INSTALLED! WE MADE UP A COUPLE OF DASH EIGHT LINES TO GO FROM THE TRANSMISSION TO THE COOLER. THEY WILL ROUTE AROUND THE TAIL SHAFT, AND THEN CONNECT TO AN FITTINGS WE INSTALLED IN THE INLET AND OUTLET OF THE COOLER. (MIKE)>> NOW THAT WE HAVE THE REAR END COMPLETELY IN, IT'S TIME TO FINISH OFF THE REAR BRAKE LINES. NOW WHAT WE HAVE HERE IS A WILWOOD FLEX LINE TIED INTO A HARDLINE THAT WE BUILT. IT HAS A THREE WAY UNION AT THE CENTER TO PASS TO ANOTHER FLEX LINE GOING UP TO THE FRONT. IT'S BEING SECURED ON THE REAR AXLE BRACING. I INSTALLED A COUPLE OF NUTSERTS, AND ADEL CLAMPS WILL BE SCREWED INTO THOSE. FINALLY THE FLEX LINES ARE CONNECTED TO THE CALIPERS. (PAT)>> ANOTHER ITEM TO ADD TO THE LIST OF INTERFERENCE HAPPENED HERE IN THE ENGINE BAY. THIS FITTING THAT'S ON THE BACK OF THE VALVE COVER IS USED TO MEASURE CRANK CASE VACUUM. WELL IT'S RESTING ON THE FIREWALL, AND WE STILL WANT TO MEASURE CRANK CASE VACUUM, BUT CHANCES ARE IF WE LEAVE THIS FITTING IN, WHEN THE ENGINE'S RUNNING, IT'LL VIBRATE AND SNAP IT OFF. SO A QUICK RELOCATION IS NECESSARY. THE VALVE COVER HAS TO BE REMOVED FOR THAT RELOCATION. SEVEN FASTENERS HOLD IT TO THE CYLINDER HEAD. NOW WE CAN REMOVE THE BARBED FITTING. REPLACING IT IS AN EIGHTH INCH PIPE PLUG. MAKE SURE YOU SEAL THE THREADS WITH PERMATEX THREAD SEALANT WITH PTFE, AND IT GOES BACK ON IN THE REVERSE ORDER. 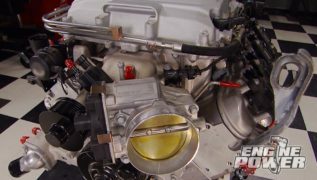 (MIKE)>> WE TOLD YOU LAST TIME WE WEREN'T GONNA BORE YOU WITH ANY OF THE WIRING, BUT WE'RE GONNA GO AHEAD AND SHOW YOU A FEW STEPS THAT ARE REALLY IMPORTANT THAT HAVE TO DO WITH THE IGNITION BOX AND THE HOLLEY ECU. NOW THESE TWO HEAVY LEADS RIGHT HERE ARE FOR THE HOT AND THE NEGATIVE FROM THE IGNITION BOX. THEY HAVE TO GO DIRECTLY TO THE BATTERY. SAME GOES FOR THE HEAVY RED LEAD FROM THE HOLLEY ECU. NOW WE HAVE TO EXTEND THESE BECAUSE THE BATTERY'S MOUNTED IN THE TRUNK. WHEN WE WIRE A CAR LIKE THIS WE LIKE TO PROTECT THE WIRES WITH SOME KIND OF WRAP. NOW THIS IS DEI'S PROTECTAWIRE EASY LOOM. IT COMES IN SEVERAL DIFFERENT SIZES, AND IT'LL AVOID THE WIRES FROM BEING CHAFFED ON ANY METAL OBJECTS. HERE'S A LITTLE TIP WHEN USING LOOM LIKE THIS. ANY SPLICE CONNECTIONS YOU'RE GONNA MAKE, MAKE SURE YOUR WIRE LENGTHS ARE STAGGERED. THAT WAY YOU DON'T HAVE A BUNCH OF CONNECTORS IN ONE SPOT BLOWING OUT OF THE SIDE OF THE LOOM. IT'S PRETTY SIMPLE. I WENT AHEAD AND RAN THE WIRES THROUGH THE SHEET METAL ON THE TUB WORK AND FOLLOWED THE MAIN BATTERY CABLE BACK HERE TO THE BATTERY. NOW WE HAVE ONE LEAD, WHICH IS THE NEGATIVE, THAT'LL GO TO THE NEGATIVE TERMINAL, AND TWO LEADS WILL GO TO THE POSITIVE. WE'RE NOT HOOKING ANYTHING TO THE BATTERY YET BECAUSE A BUNCH MORE WIRING HAS TO BE DONE. NOW IT'S TIME TO WIRING THE VR ONE FUEL PUMP CONTROLLER FROM HOLLEY. IT DOES REQUIRE USING A RELAY. THIS IS A 30 AMP UNIT. NOW YOU COULD MOUNT THIS THING ALL THE WAY AT THE FRONT OF THE CAR BUT THEN YOU'D HAVE TO RUN A LOT OF WIRES TO THE REAR. SO WE'RE MOUNTING THE RELAY RIGHT NEXT TO THE CONTROLLER, AND THE ONLY WIRE WE NEED COMING FROM UP FRONT IS A SWITCHED 12 VOLT. 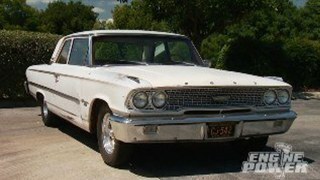 (PAT)>> OUR 588 INCH BIG BLOCK CHEVY INSTALLATION CREATED A FEW CHALLENGES. ONE OF THEM WAS HOW TO GET A FAN ASSEMBLY IN BETWEEN THE RADIATOR AND THE FRONT OF OUR MEZIERE WATER PUMP, BUT WE WERE ABLE TO SOLVE THAT DILEMMA BY CONTACTING RAINBOW PRODUCTS IN MOUNT ULLA, NORTH CAROLINA. WE PICKED UP ONE OF THEIR EXTREME FAN AND SHROUD ASSEMBLIES. NOW THIS THING IS THIN, TWO AND FIVEEIGHTHS OF AN INCH THICK TOTAL, INCLUDING THE SHROUD, AND IT COMES WITH A MASSIVE 17 INCH DUAL SPEED PULLER TYPE FAN. I DID HAVE TO BEND UP A COUPLE OF BRACKETS OUT OF MILD STEEL SO WE CAN ATTACH THE ASSEMBLY TO THE OUTER RADIATOR MOUNTS, AND WHEN WE COME BACK FROM THE BRAKE WE'RE GONNA SHOW YOU HOW THIS GOES IN THE CAR. (PAT)>> HEY, WE'RE BACK AND JUST ABOUT READY TO STICK IN OUR EXTREME FAN AND SHROUD ASSEMBLY FROM RAINBOW PRODUCTS INTO OUR NOVA, BUT BEFORE WE DO THAT WE'VE GOT TO ATTACH THE BRACKETS I FABBED UP EARLIER. BEFOREHAND I MOCKED UP EVERYTHING TO LOCATE WHERE THE MOUNTING HOLES GO. ARP FASTENERS CINCHED THEM DOWN. I HAVE TO SNAKE THE WHOLE THING IN BECAUSE IT'S A VERY TIGHT FIT. MORE ARP BOLTS WILL KEEP IT IN PLACE. AFTER ALL THAT I THINK IT TURNED OUT PRETTY COOL. I'LL MOUNT THE DUAL SPEED FAN CONTROLLER RIGHT NEXT TO THE RADIATOR SO WE HAVE EASY ACCESS TO THE TEMPERATURE CONTROL. (MIKE)>> WIRING IS ALWAYS A TIME CONSUMING TASK THAT YOU DON'T WANT TO MESS UP. MISTAKES HERE COULD LEAD TO BURNT HARNESSES, OR EVEN WORSE, FRIED COMPONENTS. NOW YOU WANT TO MAKE SURE TO HAVE PATIENCE AND MAKE SURE EVERYTHING IS DONE RIGHT THE FIRST TIME. NOW I'VE BEEN WIRING THIS CAR FROM THE FRONT TO THE BACK AND EVERYTHING IN BETWEEN FOR THE LAST COUPLE OF DAYS. SO NOW IT'S TIME FOR THAT MOMENT OF PRIDE, OR THE MOMENT OF EPIC FAILURE. (PAT)>> WHEN YOU SEE A DRAG CAR STAGE UP AND GO TO FULL THROTTLE BEFORE IT LAUNCHES THEY'RE USING A TRANS BRAKE, AND WHAT A TRANS BRAKE IS. 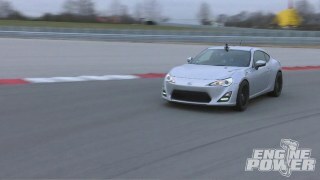 IT PUTS THE TRANSMISSION IN FIRST AND REVERSE AT THE SAME TIME, KEEPING THE CAR STATIONARY. IT'S ACTIVATED BY A BUTTON THAT THE DRIVER PUSHES, AND WHEN THAT BUTTON IS RELEASED IT GOES INTO FIRST GEAR AND THE CAR LAUNCHES. OUR BUTTON IS A BIONDO RACING DOUBLEO WE ORDERED FROM SUMMIT RACING. HERE'S THE ACTUAL TRANS BRAKE SOLENOID ON THE TRANS. WHEN THE BUTTON IS PRESSED THE ACTUATOR MOVES INWARD, WHICH VERIFIES IT WORKS PROPERLY. (MIKE)>> THE NEXT COMPONENT WE'RE GOING TO TEST IS THE LINE LOCK. IT'S PLUMBED IN SERIES WITH THE FRONT BRAKES. NOW FOR A BURNOUT THE DRIVER WILL PUMP THE BRAKE PEDAL A FEW TIMES AND HOLD IT FIRM. AT THAT POINT HE'LL HIT THE LINE LOCK BUTTON. OURS IS MOUNTED ON THE SHIFTER. WHEN HOLDING THE BUTTON, YOU RELEASE THE BRAKE PEDAL. THE SOLENOID KEEPS THE PRESSURE ON THE FRONT BRAKES WHILE RELEASING IT FROM THE REAR. THEN COMES THE BIG SHOW, THAT SMOKEY BURNOUT. THE LINE LOCK SOLENOID IS MOUNTED UNDER THE MASTER CYLINDER, AND YOU WON'T SEE ANYTHING MOVE BUT YOU CAN HEAR IT CLICK, WHICH MEANS IT'S WORKING TOO. (PAT)>> AN ENGINE NEEDS FUEL TO RUN. SO WE'RE GONNA CHECK THE FUEL PUMP NEXT. IT WAS WIRED IN USING THE VR ONE SPEED CONTROLLER THAT CAME WITH IT. A RELAY IS USED IN LINE AS WELL. THE SWITCHED WIRE TO TRIGGER THE RELAY IS HOOKED TO OUR SWITCH PANEL. THIS ROCKER HAS A PRIME AND AN ON POSITION. RIGHT NOW WE JUST WANT TO MAKE SURE THE PUMP RUNS, AND IT DOES. FAIRLY QUIET TOO FOR SUCH A POWERFUL PUMP. ANOTHER SUCCESSFUL WIRING JOB. 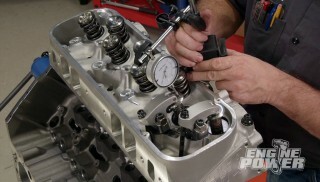 (MIKE)>> ANOTHER COMPONENT THAT HAS TO BE WIRED CORRECTLY IS THE WATER PUMP. NOW YOU NEED TO MAKE SURE THAT YOU HAVE THE RIGHT SIZE RELAY AND ALL OF YOUR CONNECTIONS ARE SUPER SOLID. YOU KNOW WHAT HAPPENS IF IT'S NOT WIRED CORRECTLY AND FUNCTIONING RIGHT. IT CAN BE A DISASTER. IT NEEDS TO BE ON WHEN THE IGNITION IS HOT. IF CONTROLLED BY A SWITCH, IT COULD BE ACCIDENTALLY LEFT OFF BEFORE NOTICING AN OVERHEATING SITUATION. THE PRIDE AND CONFIDENCE LEVEL IS SUPER HIGH RIGHT NOW. WE HAVEN'T HAD ANY EPIC FAILURES. WE HAVE TO TAKE A BREAK, BUT WHEN WE COME BACK WE'RE GONNA TEST SOME MORE THINGS OUT. SO DON'T GO ANYWHERE. (PAT)>> WE DON'T HAVE MUCH TIME LEFT. SO WE'RE GONNA SEE HOW FAR WE CAN GET. WE STILL HAVE TO TEST SOME STUFF IN THE ELECTRICAL SYSTEM TO MAKE SURE IT'S FUNCTIONING PROPERLY. WE'VE ALREADY HAD GOOD SUCCESS WITH THE TRANS BRAKE, LINE LOCK, FUEL PUMP, AND WATER PUMP. SO IT'S TIME TO MOVE ON. THE STARTER IS NEXT, AND WE WIRED IT LIKE AN OLD FORD VEHICLE USING AN EXTERNAL SOLENOID, WHICH WE SHOWED YOU EARLIER. THE TRIGGER WIRE IS CONNECTED TO THE IGNITION SWITCH AT THE KEY. THIS CIRCUIT IS ONE OF THE HIGHEST AMP DRAWS IN THE VEHICLE. SO MAKE SURE YOU HAVE PROPERLY SIZED LEADS. ALL RIGHT, THE MOMENT OF TRUTH, SEE IF IT TURNS OVER. (PAT)>> THERE YOU GO, VERY NICE. NO SMOKE, STARTER ACTUALLY SOUNDS GOOD, GOOD DEED DONE, AND THAT'S ONE MORE THING THAT'S CHECKED OFF THE LIST. (MIKE)>> VERY COOL! HERE'S A SUPER IMPORTANT SAFETY TIP. NO MATTER WHAT CAR YOU'RE BUILDING OR WHAT YOU'RE WORKING ON PLEASE MAKE SURE THAT THE NEUTRAL SAFETY SWITCH FUNCTIONS PROPERLY. NOW ITS JOB IS TO TOTALLY ELIMINATE THE POSSIBILITY OF THE CAR STARTING IN ANY OF THE FORWARD GEARS OR IN REVERSE. NOW THIS IS A FUNCTION THAT WILL BE CHECKED AT ANY RACE TRACK YOU GO TO BY THE TECH OFFICIALS. IF IT DOESN'T WORK PROPERLY THEY'RE SENDING YOU HOME. NOW HERE'S A QUICK DEMONSTRATION. IF WE PULL THE SHIFTER BACK IN ANY OF THE FORWARD GEARS THE CAR WILL NOT START. BRING BACK UP INTO NEUTRAL AND WE HAVE KEY. REVERSE, NOTHING, PARK, IT FUNCTIONS PROPERLY AND WOULD PASS TECH. ALL THE COMPONENTS THAT WE TESTED TODAY HAVE TO DO WITH SUPPORTING THE DRIVETRAIN. NOW WE HAVE TO MAKE SURE THE STUFF ON THE BODY SIDE WORKS. PAT, HIT THE BRAKES, AND IT DOES. LET'S SEE IF THE KILL SWITCH WORKS, AND IT DOES AS WELL LIKE IT SHOULD. NOW THE NEXT TIME YOU SEE THIS NOVA IT'S GONNA BE MAKING NOISE. WE'RE JUST AS EXCITED TO SEE IT AS YOU GUYS ARE. (PAT)>> BUT REMEMBER, PATIENCE IS A VIRTUE. ONE OF THE VERY FIRST QUESTIONS ASKED BETWEEN GEARHEADS WHEN CHECKING OUT A VEHICLE IS HOW BIG IS THE ENGINE? WELL OBVIOUSLY THEY'RE TALKING ABOUT ITS CUBIC INCH DISPLACEMENT. FROM THE LOCAL CAR SHOW TO THE RACE TRACK, THAT IS USUALLY THE QUESTION THAT GETS ALL OF THE BENCH RACE SMACK TALK STARTED. FIGURING CUBIC INCH DISPLACEMENT IS RELATIVELY EASY IF YOU KNOW A COUPLE OF MEASUREMENTS AND HOW MANY CYLINDERS THE VEHICLE HAS. THE FORMULA IS POINT SEVENEIGHTFIVEFOUR, WHICH IS A DERIVATIVE OF PI, TIMES THE BORE, TIMES THE BORE, TIMES THE STROKE, TIMES THE NUMBER OF CYLINDERS. NOW THAT SAME FORMULA CAN BE USED TO FIGURE CUBIC CENTIMETERS IN IMPORTANT APPLICATIONS, BUT THE BORE AND STROKE IS USUALLY GIVEN IN MILLIMETERS. SO YOU'LL HAVE TO MOVE THE DECIMAL PLACE ACCORDINGLY, AND ALSO YOU CAN FIND A VALUE FOR LITERS, JUST KEEP MOVING THE DECIMAL POINT, AND FYI, ONE LITER EQUALS 61.0237 CUBIC INCHES. 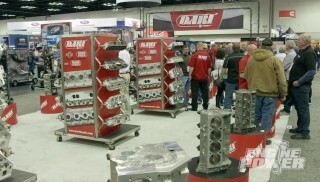 IN SANCTIONED RACING OF ALL TYPES RACING ENGINES HAVE A CUBIC INCH LIMIT. 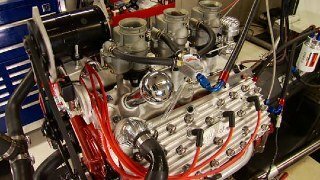 WHY, BECAUSE THE BIGGER THE ENGINE IS THE MORE POWER POTENTIAL IS HAS FOR THE MOST PART, AND THAT'S WHY ENGINE BUILDERS AND RACERS ALWAYS BUILD THEIR RACE BULLET UP TO THE LIMIT OF ITS CUBIC INCHES. IN STREET APPLICATIONS, WELL THERE ARE NO LIMITS ON HOW BIG YOU CAN BUILD AN ENGINE. YOUR ONLY LIMIT IS YOUR BUDGET. IT'S ADVANTAGEOUS ESPECIALLY IN A PUMP GAS BURNER TO BUILD AS BIG OF AN ENGINE AS POSSIBLE TO MAKE GOOD POWER. I'M SURE YOU'VE HEARD THE TERM, THERE'S NO REPLACEMENT FOR DISPLACEMENT. 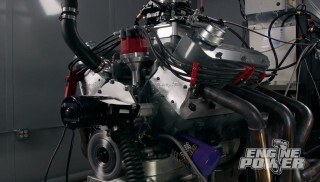 THE MORE CUBIC INCHES YOU HAVE, THE MORE POWER POTENTIAL THE ENGINE WILL HAVE DEPENDING IF YOU HAVE THE PARTS TO DO SO. 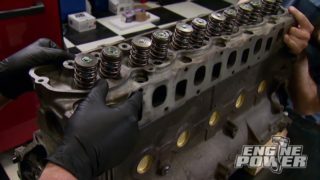 INDUCTION AND VALVETRAIN PLAY THE BIGGEST ROLES, BUT THE ENTIRE COMBINATION AND HOW WELL IT'S TUNED IS IMPORTANT AS WELL. SO WHAT WOULD BE THE CASE TO DECREASE CUBIC INCHES? 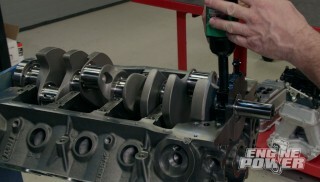 YOU HEAR THE TERM DESTROKING AN ENGINE. 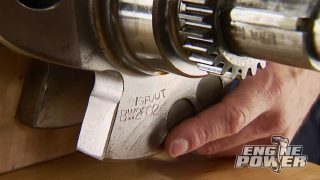 IT MEANS PUTTING A CRANK SHAFT IN WITH A SHORTER AMOUNT OF STROKE AND IT'S ASSOCIATED PARTS TO DECREASE THE CUBIC INCH DISPLACEMENT. ONE REASON YOU WOULD EVER WANT TO DO THIS IS IF YOU WERE RACING IN A CLASS THAT REQUIRED LESS CUBIC INCHES. THERE AREN'T REALLY ANY ADVANTAGES TO HAVING A SMALLER ENGINE ON THE STREET, ESPECIALLY PUMP GAS BULLETS. REMEMBER WHEN WE TALKED ABOUT SPECIFIC OUTPUT? WELL HERE IS AN EXAMPLE OF THREE DIFFERENT ENGINES THAT HAVE THE SAME CYLINDER CASE, HAVE THE SAME SPECIFIC OUTPUT, THEY JUST HAVE DIFFERENT CUBIC INCHES. 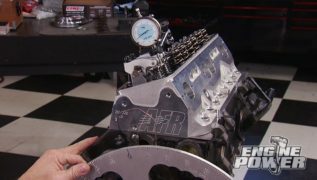 A 302 INCH ENGINE AT ONE POINT FOURFOUR PER CUBE MAKES 438.88 HORSEPOWER. 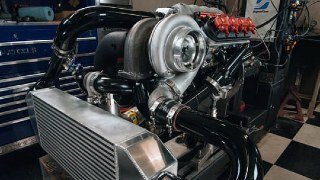 A 351 INCH ENGINE AT ONE POINT FOURFOUR MAKES 505.44, AND A 427 INCH ENGINE AT ONE POINT FOURFOUR PER CUBE WILL CRANK OUT 614.88 HORSEPOWER. ALL OF THESE RUN ON PUMP GAS, ALL ARE THE SAME PHYSICAL SIZE, AND THEY ALL COST THE SAME. WHICH ONE WOULD YOU WANT TO RUN? VERY FEW PRODUCTS ARE AS WIDELY KNOWN IN THE AUTOMOTIVE INDUSTRY AS SEAFOAM MOTOR TREATMENT. SINCE 1942 IT'S BEEN KEEPING ENGINES RUNNING CLEANER AND SMOOTHER BY REMOVING GUM, VARNISH, AND DEPOSITS FROM INTERNAL ENGINE COMPONENTS. IT CAN BE ADDED TO ENGINE OIL. GASOLINE, DIESEL, OR EVEN ETHANOL OR TWO CYCLE BLENDS. IT'S OXYGEN SENSOR SAFE, AND WON'T HARM SEALS OR GASKETS, AND TO FIND OUT WHAT MORE IT CAN DO FOR YOU GO TO SEAFOAM SALES DOT COM. (MIKE)>> WE ARE SUPER LUCKY TO HAVE A PARTNER LIKE MATCO TOOLS. THIS IS THEIR BRAND NEW 1,600 LUMEN RECHARGEABLE FLOOD LIGHT. NOW IN THE HIGH POSITION IT'LL RUN FOR TWO CONTINUOUS HOURS, IN THE LOW POSITION FOR FOUR CONTINUOUS HOURS, AND HAS AN AUTOMATIC SHUTOFF. NOW THE HEAD SWIVELS 280 DEGREES. SO YOU CAN WORK WITH IT SUPER EASY AT ANY ANGLE. WHEN THE CHARGER IS PLUGGED IN AND YOU'RE WORKING IT WILL CHARGE. SO IT NEVER LEAVES YOU WITHOUT LIGHT. NOW THE HIGH POWER COB LED'S ARE SURROUNDED BY A DURABLE HOUSING THAT IS DUST AND WATER RESISTANT. CONTACT YOUR LOCAL MATCO DISTRIBUTOR TO GET YOUR HANDS ON ONE. (PAT)>> OPTIMA'S YELLOW TOP BATTERIES ARE A GREAT CHOICE FOR A VARIETY OF APPLICATIONS WHERE BOTH STOUT CRANKING AMPS AND DEEP CYCLE CAPABILITY IS REQUIRED. THIS CAN RANGE FROM VEHICLES WITH HIGH END AUDIO OR ELECTRONIC COMPONENTS, OFF ROAD EQUIPMENT LIKE RUNNING A WINCH OR POWERING OFF ROAD LIGHTS, TO RACE CARS WITHOUT ALTERNATORS. ITS SPIRAL CELL AGM, OR ABSORBED GLASS MAT, CONSTRUCTION MAKES IT VIRTUALLY SPILL PROOF, CAN BE MOUNTED IN ANY POSITION, AND IS 15 TIMES MORE VIBRATION RESISTANT THAN A CONVENTIONAL BATTERY. 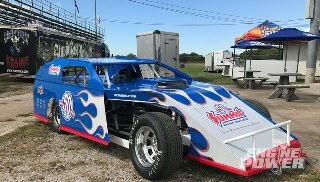 FOR YOUR SPECIFIC APPLICATIONS VISIT OPTIMA BATTERIES DOT COM. (MIKE)>> SCOTT SHOP TOWELS HELP US CLEAN UP MESSES AND PREP SURFACES ALL THE TIME. THIS IS THEIR MULTI USE TOWEL THAT'S MADE FOR CLEANING UP OIL AND GREASE. 55 COME ON A ROLL. THIS IS THEIR GLASS CLEANER LINE. THEY CLEAN UP GLASS AND EASY SPRAY AND WIPE JOBS. 90 COME ON A ROLL OF THESE. THAT'S ALL THE TIME WE HAVE FOR TODAY. SEE YOU NEXT TIME ON ENGINE POWER.